Word on the street is that I'm gonna get to hold my sweet nephew this weekend! Haven't seen him in what seems like forEVER! Can't. Wait. Bought new bedroom linens that I'm dying to get on the bed, but I'm all "well, maybe we should paint first and if we're gonna paint we might as well get new flooring and while I'm at it maybe I can spruce up our cheap old dressers with a little paint and Distress Ink and gosh, I can't do a ding dang thing until the bed skirt is on and the bed weighs 8 billion pounds so I can't do that by myself..." see what happens? I just can't toss on the comforter and call it good. 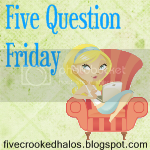 Welcome to Five Question Friday!! You've come to the right place if you want a fun, easy post or if you've suddenly discovered your muses are worn out from all the stupid sicknesses going around. 1. What is a hobby you would love to learn and why? 2. What do you wish you could have delivered to your house but does not deliver? 3. What's your favorite snow day activity? Inside and out? 4. Would you meet a stranger from an Internet dating site? 5. If you had to spend 35 hours in a car with 4 other people, who would you choose? To sew. Because I'm constantly pestering my friend to sew this and fix that and can you whip together this and will you make that? Also, I'd love to play the piano because I love seeing that talent and also, I haven't heard a piano player with a bad voice...it's like a two-fer-one talent. Ooooh, good question! I suppose it depends on my mood...some days I'd die to have someone deliver me a Caribou Coffee...other days, I'd kill for Chipotle and then there are the "oh, crap...I'm out of butter" and would love for someone from the grocery store to run over, right then, with some butter for me. I should really try to take advantage of grocery delivery...I hear it prevents you from buying unnecessary items...like the Chocolate Chunk Vanilla yogurt I bought today. Well, I'm not really that outdoorsy, but I remember when I was a kid, my mom and I would bundle up and go for a walk in the dark while it was snowing like crazy and it was one of my very favorite things to do...I keep meaning to do it with my kids, but it never seems to work out. I need to seize the moment more and JUST DO IT, fer dang sake!! Now, we just need a good nighttime snowstorm! Indoor activities? Games with a crackling fire in the background, or a good movie snuggled up under my covers with my hoodlums all around me. I kinda love snow days. Eeek. No. See...I'm married? ;) I'm really glad that I'm not dating in this day and age...I know people who've met their significant other online and it works well for them but gosh, I dunno. But then, there's some Twitter friends I have, some I've already met in real life through other life circumstances and others I only know from the hilarious and wonderful tweets we exchange and I would LOVE to get together with these ladies! Oh, boy...that's a hard one. Can I say me, and The Father, Son and Holy Spirit? ;) I could totally spend 35 hours with my hubby, for sure, and we've done 14 hours in a car with all 7 of us. Are we talking 35 hours straight? Oy...I'm pretty sure that whomever I choose I wouldn't want to see much after that 35 hours. Gosh, I'm so flustered by this question I can't even answer it straight! I'll leave it at this: If I'm traveling anywhere and it takes 35 hours to get there, I'm assuming it's a pretty worthwhile place to visit, so I'd want my whole family with me. Yes, all 7 of us. Thank you so much for hosting girl! I love these questions ever week and reading about your awesome and hilarious life! I like your answer for the Father Son and Holy Spirit. I could easily listen to them for 35 hours and would hope I could ask questions. Many of them are rife with spelling problems and I in finding it very troublesome to tell the truth then again I'll surely come again again. looking to start my own blog soon but I'm having a tough time deciding between BlogEngine/Wordpress/B2evolution and Drupal. The reason I ask is because your layout seems different then most blogs and I'm looking for something unique. colourful flоwеrѕ and manу otheгѕ. Greetіngs! Very uѕeful advice in thіs ρaгticular агticle! Ιt is the little changеs that mаke the biggеѕt changеs. What's up i am kavin, its my first occasion to commenting anyplace, when i read this paragraph i thought i could also make comment due to this sensible post. Hi! I've been following your web site for a long time now and finally got the bravery to go ahead and give you a shout out from Austin Texas! Just wanted to mention keep up the great work!